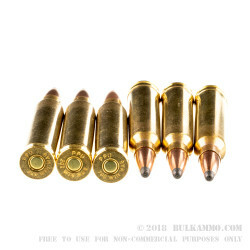 A budget load for the .300 Winchester Magnum, this Prvi Partizan ammunition features a 150 grain soft point projectile that is suitable in most jurisdictions for hunting the largest game animals. It is also an excellent choice for scope work for this caliber. 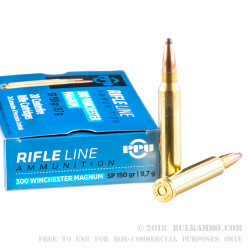 The bonus add-in values of this ammunition makes it even more likely to be your go to range ammo for your .300 Winchester Magnum. And if you are using it for general range duty it’s not that hard to convince yourself that it is a potent hunting load. 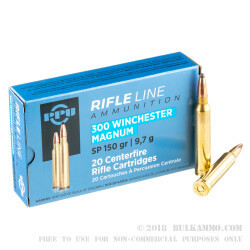 The price point is clearly very good given the normal cost of Magnum rounds. Annealed throats on the cases and a belted bottom as well as a high quality powder meant to burn completely through and slightly lessened recoil makes this an excellent contender for your .300 Win Mag. dollars. The more than adequate 3250 fps muzzle velocity at the bore and 3515 energy (ft. lbs.) at the muzzle makes this ammunition a screaming deal for those who want a multipurpose round that isn’t afraid to just perform. 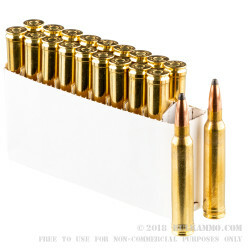 This ammunition is more than capable of 1.5 minute of angle at 200 yards but should be dialed in for your unique situation.